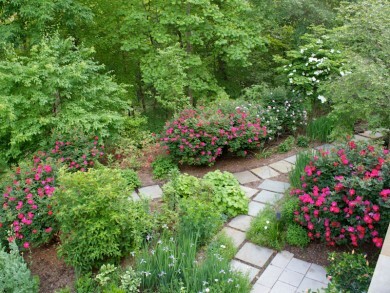 Flower gardens can be just what you need to establish color and beauty in your landscape. The key to creating a successful design is in the mix of flowers you select, the quality of plant installation, and finding a location that produces the right amount of sunlight. Ongoing garden maintenance is also important to the sustained growth and beauty of your flower beds. At O’Grady’s Landscape, we are experts in all aspects of garden design and plant installation, including flower beds. If you are located in Northern Virginia and are interested in our custom flower bed designs, give us a call at (703) 533-5001 or request your consultation online. We have created numerous flower bed designs for properties in North Arlington, McLean, Vienna, Great Falls, and the City of Falls Church since we were established in 1991. In that time, we have learned a thing or two about what comprises the best designs. When you choose us for your project, you can rest assured that we have extensive knowledge of the best plants to thrive in Northern Virginia’s climate and can provide you with the right mix of flowers to promote color and visual interest in your landscape year round. We also pay close attention to the surrounding architecture to find a flower bed style, size, and location for a finished result that perfectly complements your home and brings out the beauty of your landscape design. Are you ready to bring flower beds to your landscape? Contact O’Grady’s Landscape today! We can help you select the best mix of flowers and plants for a colorful, beautiful garden bed and ensure it’s installed in the best place, and with the best methods, to stay healthy and beautiful long term. If are you interested in getting started, please contact us to request your consultation and get your free estimate. We typically respond within one business day! Check out our plant gallery for photos of our flower bed designs and other garden ideas. North Arlington, McLean, Vienna, Great Falls, and the City of Falls Church, VA.